and also not as many Christmas makes﻿ as last year. I did revamp an ivy wreath I put together from a garland that was looking a bit worse for wear and I added some little salt dough cherubs which I made about 15 years ago!... I can believe I made them so long ago now and that they have lasted so well. They look happy here even though it was a quick re-do, I'm sure next year I will spend a bit more time on it and perhaps add bigger bow. we tied them to the garland that hangs over our dining room archway. My two older children David and April came home to stay for Christmas. The template I used to make the stocking last week came in very handy when I couldn't find Davids. A little bit of felt holly & free machine letters add a festive touch! 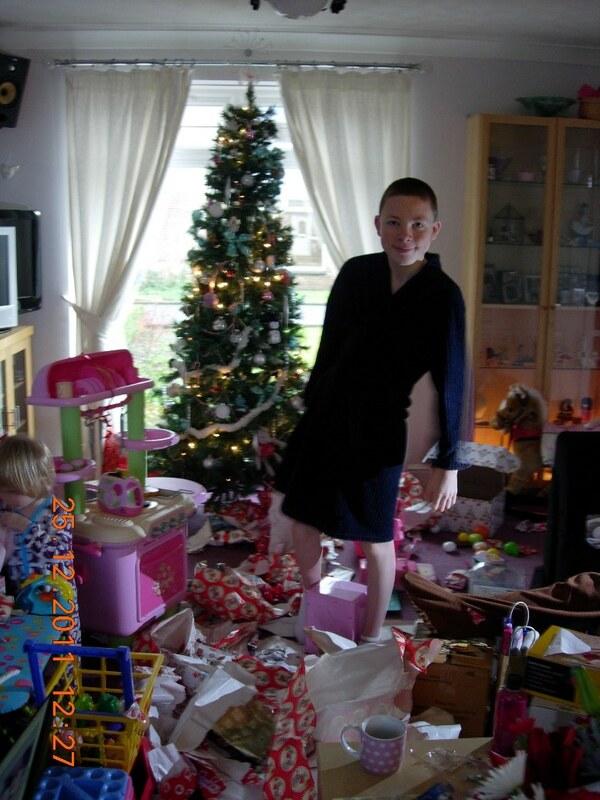 Santa did eventually come, not a great shot as it was taken at quite a late hour not as late as the time stamp though I think its about a couple of hrs out. I don't usually use the time stamp it got switched on by accident. I feel very proud that every toy item that we got for Charlotte was not a 'new buy' but thrift finds on Gum tree, charity shops and our local car boot sale, My older kids too got some items from the same and the 'new buys' that we did get were purchases made possible from selling things we already had and for one reason or another no longer required, clothes, toys, household and electrical items. Both Kevin and I agreed that it was a much more satisfying approach to Christmas spending. 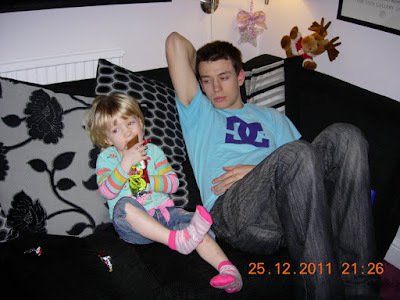 Charlotte with big brother David enjoying her chocolate Santa. We had a family get together at ours on Boxing day and I was delighted that some of them took me upon the idea I had last year for the charity shop secret Santa. A lovely time was had by all with some great pressies exchanged each costing no more than £5 from the boot sale or charity shop. A lovely butterfly candle holder and heart bottle stopper from my nephew Dylan. 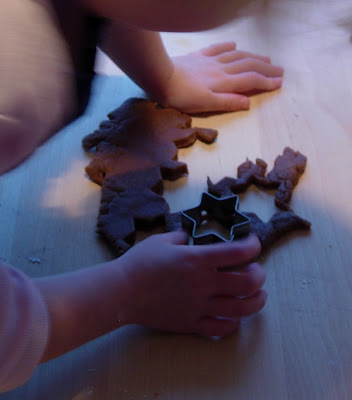 Busy busy with lots of preparations for Christmas! My friend Vicky asked me to make a stocking for her little Joshua, at very short notice. She had one made last year for Adam, but the lady who made it for her was not making them this year so she came to me. ﻿and...... I prefer free machine embroidery......with a little bit of needle felting in for good fun! The only request was that it had to be the same size. She was delighted with it! Next year I might take orders for these as it was fun to do. I changed my mind slightly on the 3rd block, I machine stitched the heart shape that I cut from the little bib on with brown to match the stitching on the flowers and cat, but I decided to hold off on adding the deeper pink flower patch. Instead added this to the 4th block which I made using the another top. Have made a little progress with the rag rug too! It measures ten inches across now. Still to add the latest little pile of leftover pieces from the tops used for the latest block.